Today - We happened outside and to our surprise we saw Atlantis riding home. It was landing at Offutt for the night so the planes were pretty low and a great view from the house. 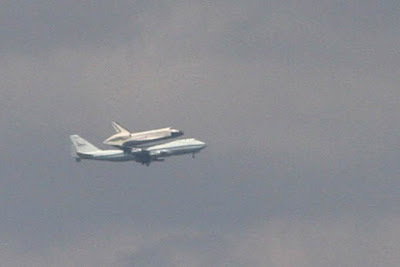 It's always cool to see a space shuttle in our opinion. Remember the time the shuttle landed at LRAFB and Mom and Dad got us out of school so we could go see it?